From time to time, clients send us text for upcoming speeches. We ensure there are no grammar mistakes, and that there are no disconnects and non sequiturs. But the actual task of writing lies with our client, and nobody can put words in your mouth the way you can! So here are some fundamentals on speech writing. Apply them the next time you address the nation, or your friends at Saturday night's party. You can't start a speech until you are sure of your central point - the idea you need the audience to remember, even if they remember nothing else. Choose a theme simple enough that it can be expressed in one sentence. There are really only a few ideas an audience is going to grasp and remember. People have done research on how much people remember from a speech, and it's amazingly little. Your sound bite should be snappy but clearly connected to your central idea, not just an unrelated one-liner. Consider the tone of your speech. What you're writing will be read aloud, not printed on a page for your audience to read. A speech must be appropriate for the size and location of your audience, as well as for its familiarity with your topic. 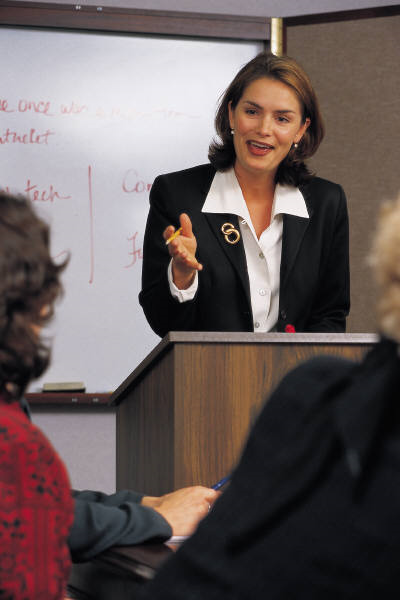 Also, successful speeches have a conversational tone, in the hope that people will almost forget that what they're hearing is a prepared text. Compared with an essay, your points have to be clearer and your sentences have to be shorter. Write like people talk. It helps to read your speech out loud while you're working on it. The opening lines of a speech are critical to its success. Establish some kind of rapport with the audience first. You want to establish up front this connection, so they will continue to listen to you. Your first opportunity is with the acknowledgments, to establish a rapport with the people who are in the front of the audience. The next thing you usually do is tell a few jokes specific to the location. However, if you have a situation like, say, the anniversary of Pearl Harbor, where it's inappropriate to use jokes, telling a very personal story can serve the same purpose to get the listeners to identify with you. According to Walter Mondale, Ronald Reagan's remark about "the youth and inexperience of [his] opponent" was, in an instant, the death of Mondale's campaign for the White House. Humor can be that effective. If an audience isn't listening, it doesn't much matter what you say. Try to make audiences identify and sympathize with you early on in a speech, so they'll want to hear what you have to say. Tell stories or anecdotes that illustrate a topic, or show that the topic is something that could have a real effect on the audience. People need anecdotal material and stories to make a point. Give the audience a stake in the speech, too. Make it emotionally compelling somehow. And be concrete. It's concrete detail that keeps people interested. Which is a more effective line, "The president's gone abroad," or "The president's hopped on a jet to Rome"? And then there is this great line: "Mr. Gorbachev, tear down this wall!" Now you've reached the heart of your speech. Keep things simple and make sure to tell your audience what you're going to say before you say it, so they won't miss your point. For example, if you're trying to get people to agree with your solution to a problem, make sure you tell them why the problem is so serious. Try to signpost the things you're going to be talking about. For example, "Today I want to talk to you about three great issues facing America," and then list those three things. Consider adding some humor between points two and three, so there isn't a thud in the middle of the speech, boring everybody to tears because it's all policy. In your conclusion, try to briefly reiterate what you've just said. It's inappropriate to do jokes there. You want to leave the listeners with a serious thought, and then say your good-byes.